32.5 miles of Britain's busy West Coast Main Line, available in both present day and 1980's versions. Drive the 110mph Class 87 25kV AC electric loco, or the 75mph Class 310 25kV AC EMU along the route. See the Projects page. The busy commuter route running from Redditch to Birmingham New Street; operated by the Class 323 25kV AC EMU. This route is being developed exclusively for BVE2, in CSV file format. See the Projects page. 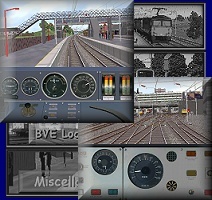 Several popular UK loco classes for BVE, available for download. See the Projects page. Station markers and signs for use in your own routes. See the Misc Files page.